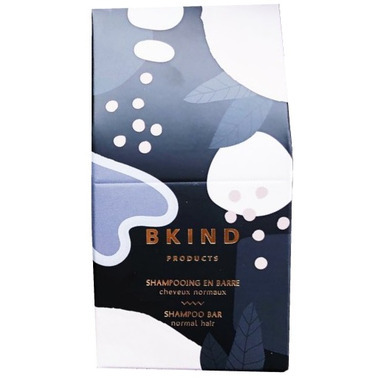 The BKIND moisturizing Shampoo Bar is made with natural ingredients and essential oils that nourish your hair and scalp without being harmful to the environment. The essential oils will give your hair brilliant shine without the use of SLS or silicone. This shampoo bar will leave your hair clean with a pleasant smell of tangerine and juniper berry. This 55 g shampoo bar lasts about 40 shampoos. Ingredients: sodium coco-sulfate, mango seed butter, kaolin, jojoba oil, grapeseed oil, sodium cocoyl isethionate, glycerin, aqua, equisetum arvense extract, mandarin peel oil, juniperus communis, pelargonium graveolens flower oil, grapefruit seed extract, Tocopherol..
My daughter LOVES this product. I love that it doesnâ€™t create unnecessary waste! I absolutely love this Canadian shampoo bar! It lathers up just like conventional shampoo and leaves your hair feeling very clean. The bar is indeed small but it lasts for a very long time. I have had mine for over two months, (I wash my hair every three days or so) and have half the bar left. I really like this shampoo bar made in Canada! The ingredients are natural and clean. But I suggest to use the matching conditioner for detangling since it has kaolin in it. My hair which is fine looks much fuller afterwards so much so that people comment on it, which is nice.